Before Mark Dever became a pastor he did his PhD work in historical theology at the University of Cambridge. 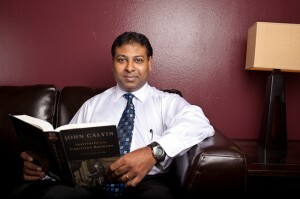 In 2007, with the resurgence of evangelical Calvinism, he did a series of 10 blog posts that combined his historical gifting with his insider look at the roots (under God) of what has been happening and why. Of course, theologically, the answer is “because of the sovereignty of God.” But I’ve never been convinced by hyper-Calvinism’s argument that because God has determined the ends, the means don’t matter. Means do matter. And as a Christian, as an historian who had lived through the very change I was considering, I wondered what factors had been used by God. Trevin Wax’s suggested supplement to Dever’s list, focusing on 9/11. Collin Hansen’s CT cover story and the book that brought the conversation into the public square. The rise of organizations devoted to developing and networking around a God-centered, gospel-driven vision. Dever mentions MacArthur, Sproul, and Piper—associated with Grace to You, Ligonier, and Desiring God. To that list could be added the Gospel Coalition, Redeemer City to City, Together for the Gospel, Acts29, 9Marks, Sovereign Grace Ministries, etc.